I completed "The Gathering" last night. For those of you who haven't been around, the painting came to me from a guided Angel meditation. I think the expressions on their faces are priceless. I have not had experience painting small faces before - they are all different and some very funny I think. My inclination when I paint it always to put in too much detail --- well --- how much detail can you cram into less than a square inch. A house call from an angel can heal a broken heart. This painting is just magnificent, Donna! 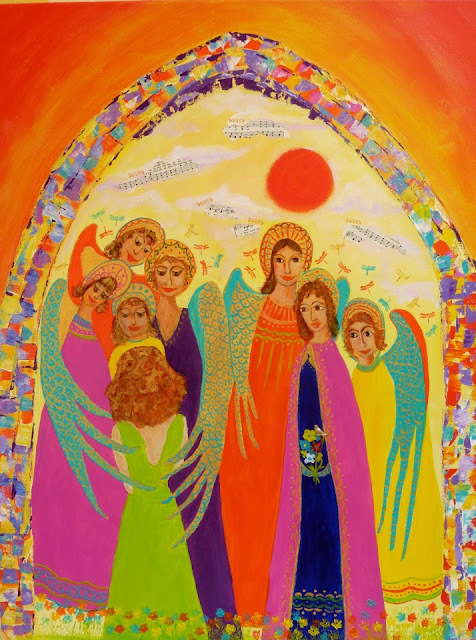 I love the gathering of angels. :) Beautiful! PERFECTO, Donna! It is just beautiful. I love how you gave each Angel their own personality... Just a gorgeous picture. Thanks for sharing. Just incredible, Donna! Angels are welcome in my studio at all times. First off, I love your colors in all of your paintings and other work. And the detail in this "beatific bunch" is really absorbing. Lovely work. Привет. Пишу из Украины. Очень хорошие ангелы, как настоящие. Вы - талант! Желаю дальнейших успехов в творчестве.